4 More Prisoners Leave Guantanamo In Waning Days Of Obama Administration : The Two-Way The four released detainees are from Yemen and have been accepted by Saudi Arabia. They were never charged and had been at the Guantanamo Bay prison for more than 14 years. 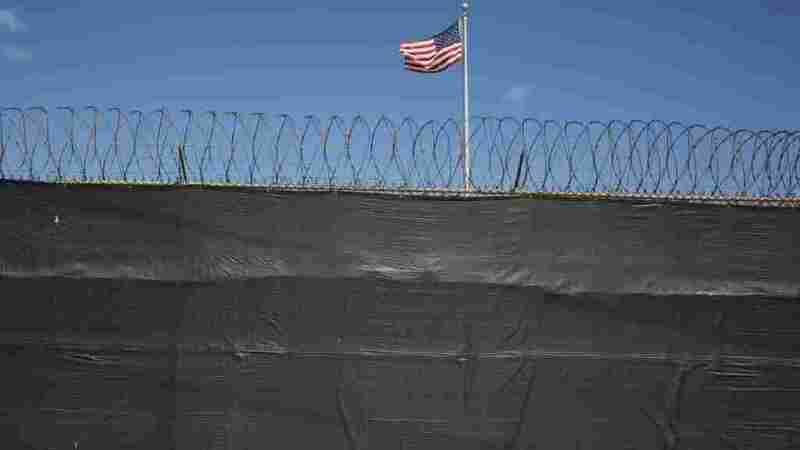 A flag waves inside Camp 6 at the Guantanamo Bay prison in Cuba last February. Since the Obama administration hasn't been able to close the prison at Guantanamo Bay, Cuba, the push has been on to transfer as many of the cleared detainees as possible before Donald Trump becomes president. The Pentagon announced on Thursday that four prisoners have been released and sent to Saudi Arabia, where they are expected to participate in a rehabilitation program. The four are from Yemen and had been held at Guantanamo for more than 14 years. They were suspected of being low-level militants with ties to al-Qaida but were never charged. The U.S. must find other countries to accept Yemeni prisoners because it will not send Yemeni prisoners back to their homeland, fearing that the civil war there will make it impossible to monitor them and ensure they do not return to militancy. In Saudi Arabia, the government and state-run media did not immediately disclose the transfers. Over 130 detainees from Guantanamo have been sent to the kingdom, making it second only to Afghanistan. Transferring the prisoners to Yemen remains impossible as the Arab world's poorest country remains in the grips of a Saudi-led war and rebels hold its capital. Fifty-five prisoners remain at Guantanamo — 19 are cleared for release. It's estimated that about 40 will still be left there by the time Obama leaves office. President-elect Donald Trump has vowed to keep the detention center open and "load it up with some bad dudes." Republican opposition in Congress has interfered with Obama's efforts to close the prison. Lawmakers have also barred him from moving any prisoners to the U.S. mainland. The short answer is that Congress made it impossible for him to do it, but the long answer is, when he came into office, he thought he was going to look at the prisoners of Guantanamo and either try them or let them go. But he realized that there was a third category, these forever prisoners — people he couldn't put on trial, people he was unwilling and his administration was unwilling to send away to other places. So it became — to close Guantanamo meant to move Guantanamo, to pick up these forever prisoners and the people who would be charged and move them to the United States, what we call Guantanamo North. Create Guantanamo on U.S. soil. Congress systematically blocked that. And when you can't move Guantanamo, you can't close Guantanamo. The Pentagon identified the released prisoners as Mohammed Ali Abdullah Bwazir, Salem Ahmad Hadi Bin Kanad, Muhammed Rajab Sadiq Abu Ghanim and Abdallah Yahya Yusif Al-Shibli.